"If we are Americans, then why not citizens?" People born in American Samoa are the only Americans who are not recognized as citizens. This means that a child born in American Samoa is denied the same world of opportunities available to a child born anywhere else in the United States. Learn more below how the lives of Lene Tuaua and the other plaintiffs in Tuaua v. United States have been affected. Lene Tuaua is a retired public safety officer and former Marshal for the High Court of American Samoa, who was born in American Samoa and lives there now. 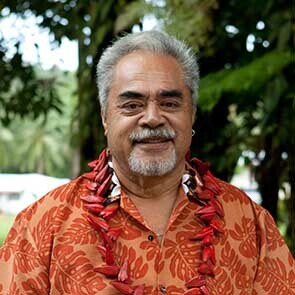 Mr. Tuaua attended college in California and resided there during the late 1960s and early 1970s. While he was living in California, he registered for the military draft during the Vietnam War, but as a “non-citizen national” he was denied the right to vote and the opportunity to serve as a police officer in the state. I believe federal laws that deny American Samoans citizenship should be challenged because I want my children to have the same world of opportunities available to them that are available to any other child born in any other part of the United States. So long as the American flag flies over American Samoa, the United States should not be able to deny us citizenship. Emy Afalava is a long-serving, decorated veteran of the U.S. Army who currently lives in Tafuna, American Samoa. During the course of his 15-year military career, Mr. Afalava was deployed as part of Operations Desert Shield and Desert Storm, including service in the infantry during the Liberation of Kuwait. Both during and after his military career, when Mr. Afalava lived in the continental United States, he was denied recognition as a U.S. citizen and consequently denied the rights of a citizen, including the right to vote in federal and state elections. 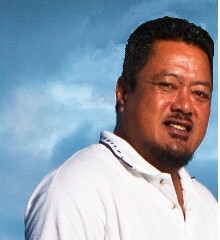 Va’aleama Fosi was born in American Samoa and currently lives in Honolulu, Hawaii. He served for more than a decade in the U.S. Army Reserves and the Hawaii Army National Guard. While in college in Hawaii, Mr. Fosi learned that as a “non-citizen national,” he was ineligible for federal work study programs and certain other federal employment opportunities. His “non-citizen national” status currently prevents him from enjoying rights available to other persons born elsewhere in the United States, including the right to vote and the right to bear arms. Fanuatanu Mamea is a decorated Vietnam War veteran who served in the U.S. Army from 1964 until he was honorably discharged in 1984. Early in his military career, Mr. Mamea was denied the opportunity to serve in the Special Forces because of his status as a “non-citizen national.” In later years when stationed on the U.S. mainland, he was denied the right to vote in state and federal elections. Mr. Mamea now lives in Tafuna, American Samoa, but at times needs to travel to Hawaii to receive treatment for his combat injuries at a Veterans Hospital. U.S. immigration law makes it more difficult for him to sponsor his wife, a foreign national, to join him on these medical visits than it would if he were recognized as a citizen. He has brought this lawsuit not only on behalf of himself, but also on behalf of his three young children, and would like them to grow up having all of the opportunities available to other American children. Taffy-lei Maene was born in American Samoa and currently lives in Seattle, Washington. Solely because the U.S. government refuses to recognize Ms. Maene as a citizen, she lost her job at the Washington State Department of Licensing, depriving her of income and health insurance. The government’s classification of Ms. Maene as a “non-citizen national” deterred her from applying for other jobs requiring proof of citizenship; although Ms. Maene has found other employment, she continues to be denied the right to vote and is not permitted to obtain an enhanced Washington State driver’s license, all because she is not recognized as a citizen. The Samoan Federation of America is a non-profit, social services organization located in Carson, California. Founded in 1965, the Samoan Federation serves the Samoan community in the greater Los Angeles area. Among other things, the Samoan Federation helps promote the political empowerment of the Samoan community in California, efforts that are hindered because American Samoan “non-citizen nationals” are denied the right to vote. The Samoan Federation also expends some of its limited resources to help members of the Samoan community with the complex naturalization process, expenditures that would not be necessary if the government recognized the birthright citizenship of persons born in American Samoa.